On my way back from a walk, I was admiring the blueness of the sky and the trees, even though they have no leaves on them. I love trees. However, I just couldn’t fully enjoy this lovely Oak tree without being distracted by these poles and wires right in front. A combination of Electricity, Cable and Telephones lines in all their glory and damn UGLY. Don’t get me wrong, I love the comforts of Telephones, electricity and TV, but is this the best we can do? The fact that we cut down trees, to make these poles and attach ugly cables blows my mind. I started thinking how this happens and I couldn’t help but think of the following. Nature / Life is there in all it’s beauty, simplicity and perfection. However many of us, chose to ignore this or forget about it and go on our “pursuit of happiness”. We start striving, adding layers, adding complexity, planning, looking for happiness externally. We will only be happy or at peace when we acheive something or when a particular event happens. I will be happy when….”I am better”, “As soon as I get that promotion”, “as soon as I have made X dollars”, “as soon as I leave this job”, “as soon as I find the lover I am after” etc etc. And off we go driven by our minds, which essentially becomes and typically is a maze of wires. These wires represent the tangled mess of our minds, but behind this ugly mess, there SHE is. Life! If we just de-cluttered and cleared our minds. Cut away the wires and made it more simplistic, revealed would be the big old Oak tree which represents life. Simple, pure and beautiful. Inside all of us. We just have to tidy and clean up the tangled wires. Love it! A lot of “wires” are underground here in Orange County, CA. Maybe life’s “exposed” wires are easier to manage. Great point. By the way had a listen to your music on Sound Cloud. Brilliant! Unusual voice and almost sounds a bit like Marc Anthony! I will take a look at that, thanks Lynda. Like the lines of focus in the shot. Thought provoking! What a great analogy … it can get complicated; just like those wires. It reminds of the ones under my desk – all attached to my computer and its peripherals. Ugh! Very good post. 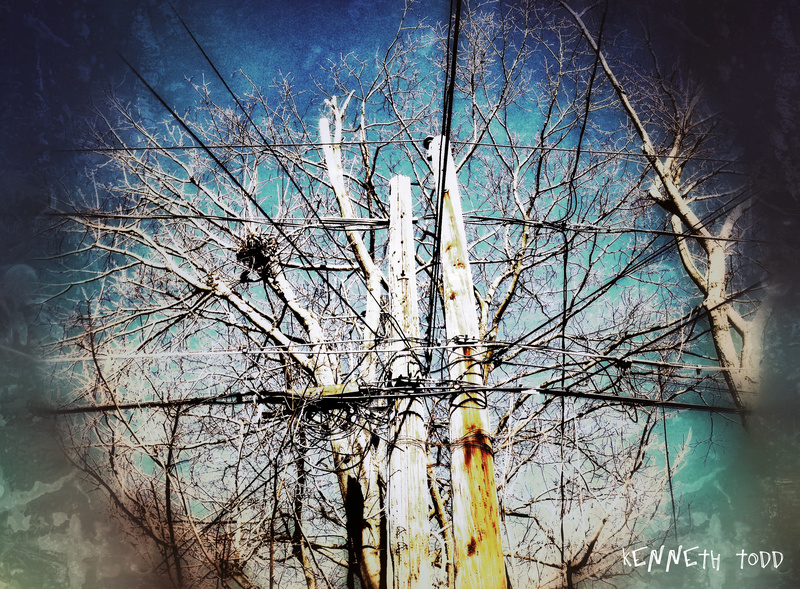 I agree that it’s sad trees are destroyed for the sake of wires. Great post, both the photograph as well as your writing. It’s true, we create our own ‘messes’….then we insist that these self-created messes won’t/can’t be cleared until all conditions are perfect. Conditions are never perfect. Looks familiar to my mind’s eye. I need a detangler! Great photo! My first thought after reading the title and seeing the photo was how much it represents the human brain with its mixture of organic material and electrical impulses. The branches resemble neurons. Your analogy of the tangled mind is perfect and I agree – we need to clean them up. I agree. We’re still erecting those poles too. Never mind that they fail us in ice and snow and in every other little incident. Why are we still doing this in the 21st century?